Sealing in the Magdalen Islands, circa 2008. Conditions are pretty good, with some ice but not so much that moving the boats around becomes difficult. When seals are spotted, the boats manoeuver as close as they can without scaring them. They will then be shot from on board, or if the ice is strong enough, a sealer may jump onto the ice and try to reach the seals before they escape. He will then dispatch them with a blow to the head from a hakapik. (In Canada, the hammer end of the hakapik is used for this.) Whether shooting or using the hakapik, sealers always follow the 3-step process to ensure a seal is dead before bringing it on board. These steps are: shooting or hitting the head; palping the skull to make sure both hemisphere are crushed (if not, use the hakapik to do it); and bleeding. 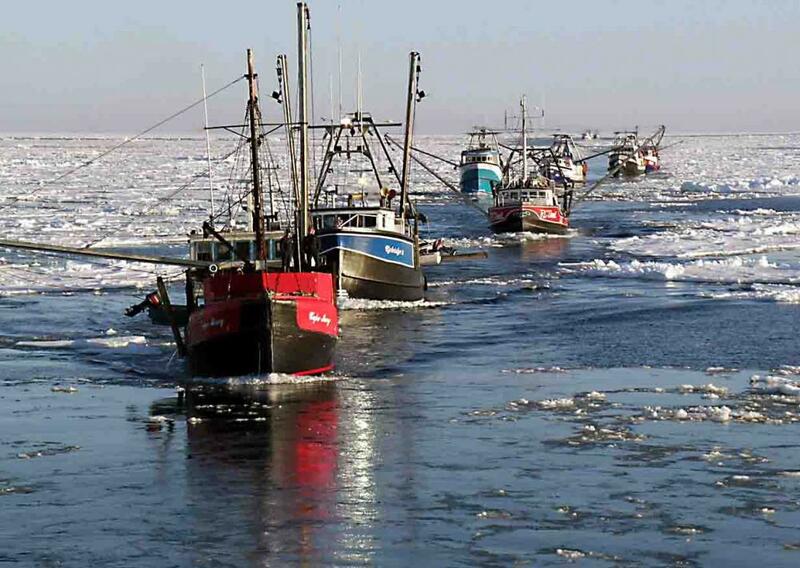 Photo: Jean-Claude Richard / Intra-Quebec Sealers Association.